Cross Bar for Background Support: This is a 3-section telescope cross bar for background support. Extend from 5 ft 5" to 10 ft with 5/8" female sockets on both ends to lock on to any light stands. Holds canvas, muslin or paper. Light stands: Versatile, Hardworking & Lightweight; 3 Section lock; Black anodized aluminum; Stable & Quick Setup; Maximum Height: 2450 MM, 98 inches; Minimum Height: 788 MM, 31.5 inches; Maximum Load Capacity 19.9 lbs; Closed Length: 750 MM, 30 inches; Footprint Diameter 900 MM, 36 inches; Mounting Stud 5/8 inches. 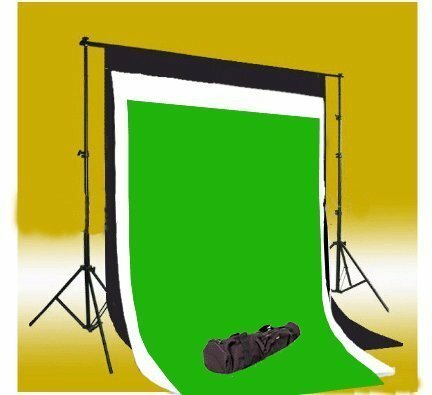 Muslin Backdrop: We have found muslin to be by far the most versatile material for photography backdrops. It is great for all types of photography: family, children, high school seniors, bridals, models, or even commercial work. Made from durable high quality muslin material; 100% cotton to absorb the light and help eliminate reflection; completely Seamless, made from one piece of material; 3" rod pocket at one end; Machine washable; Crimped along the edges to prevent tears; Light weight, easy to fold; Allow for 5-8% manufacturing shrinkage.